A few months ago, we heard that Intel was creating a discrete GPU called Arctic Sound. After the arrival of Raja Koduri at Intel, the project became more ambitious. Now Arctic Sound will be split into two families: one aimed at data centers and another one for gaming and professional environments. Koduri said that Intel will "enter the market with a bang" with the Arctic Sound dGPU. According to a report from the analyst Ryan Shrout, we will see the first Intel discrete graphics chips in 2020. This information was revealed by Intel CEO Brian Krzanich during an analyst event last week. Furthermore, Intel confirmed this information with a Tweet that you can see below. The CES 2019 is way too close for the first Intel dGPU and we think that 2020 is already an aggressive and ambitious date. 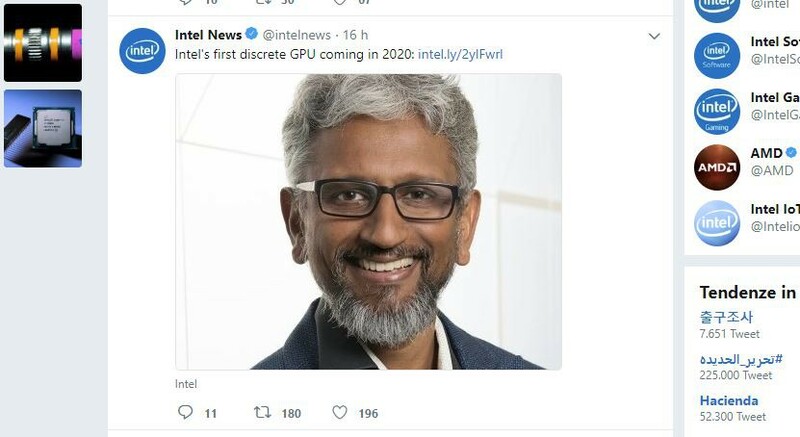 Since Intel will most likely reveal the product during some exhibition, we might expect this dGPU during the Computex 2020 or the CES 2020. It's good to see that we will have a third player in the dGPU market after AMD and NVIDIA, and we are quite curious to see what Intel can do.